A jack is a mechanical device used to elevate the axle of a vehicle so that one wheel is raised off the ground, enabling one to access and change the tire. 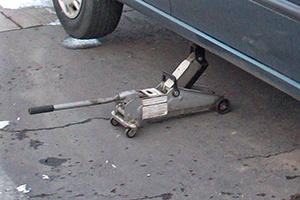 In simple car jacks, a handle is used to turn the springs of the mechanism so that the device can raise the axle. The handle, which resembles a crowbar, is also used to remove the hubcap if the wheel has one. "Floor jack and handle, December 23, 2008" by Alisha Vargas is licensed under CC BY.